Everyone loves pasta, but during hot summer days a bowl of steaming pasta doesn’t sound that appealing. Some people make cold macaroni salads, but I think pasta is not meant to be eaten cold and besides, those macaroni salads usually have mayonnaise in them and fill you up too much. The Italians have an ideal solution. Basically it’s a dish of hot pasta that cools down by virtue of being tossed with uncooked ingredients. They call it a salsa cruda. This is a raw sauce used with pasta. It’s quite popular during a hot summer. The basic idea behind a salsa cruda is that the ingredients in the sauce are not cooked and are merely warmed by the hot pasta after it’s been drained. 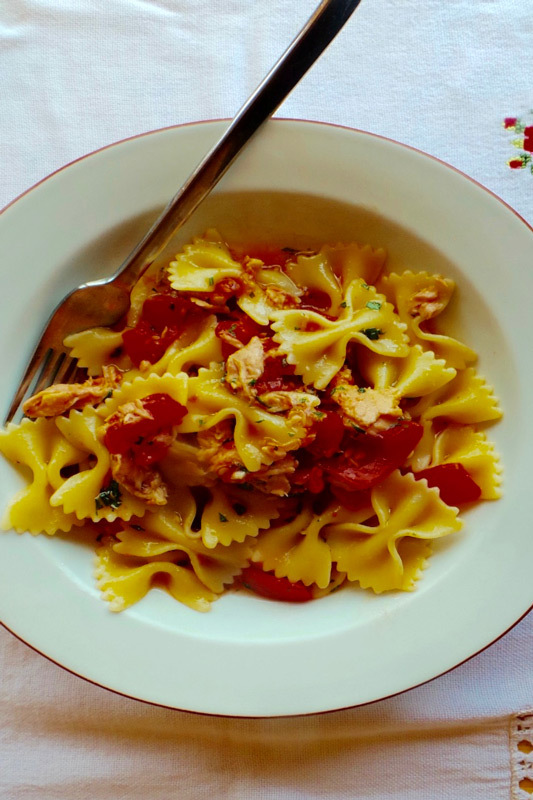 In the first dish, farfalle with raw sauce, the salsa cruda is made of canned tuna, fresh tomatoes, fresh basil and garlic. It is tossed with the farfalle, a butterfly or bowtie-shaped pasta. 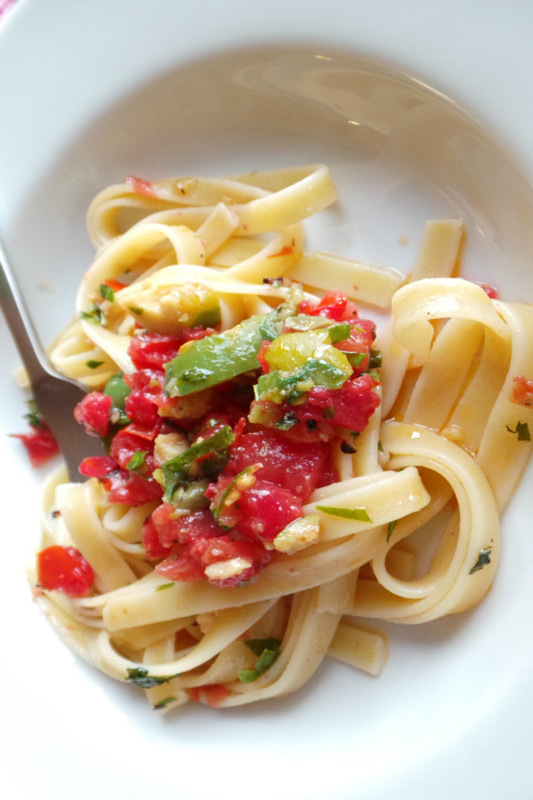 A second idea is fettuccine tossed with a melange of uncooked ingredients such as olives, capers, tomatoes, mint, lemon, parsley and garlic, which is typical of southern Italy and constitutes a raw sauce that screams “summer.” This is a nice first-course pasta before having grilled fish. In a third preparation, also perfect for a hot summer day, the salsa cruda is made with canned sardines tossed with fresh mint and parsley, and ripe tomatoes that are heated through only by virtue of the cooked and hot spaghetti. It should be lukewarm when served and is nicely accompanied by crusty bread to soak up remaining sauce. This dish can be whipped up in no time as it uses a raw sauce with fresh ricotta that melts slowly from the heat of the pasta, but not completely, and with thinly sliced prosciutto. And better still would be to use fresh artichokes, if you don’t mind the work involved. Instead of garnishing with parsley, you garnish this dish with finely chopped tomato. 1. Bring a large pot of water to a rolling boil, salt abundantly then cook the pasta, stirring occasionally, until the pasta is al dente. Drain without rinsing. 2. In a large bowl that will hold all the pasta, stir the garlic, parsley and mint together and then mix with the tomato, sardines, capers, olive oil and a pinch of salt. Transfer the pasta to the bowl and toss with the sauce and abundant black pepper and serve. 2. Meanwhile, in a bowl, gently toss the ricotta, olive oil, artichokes, prosciutto, mint, lemon juice, salt and pepper together. 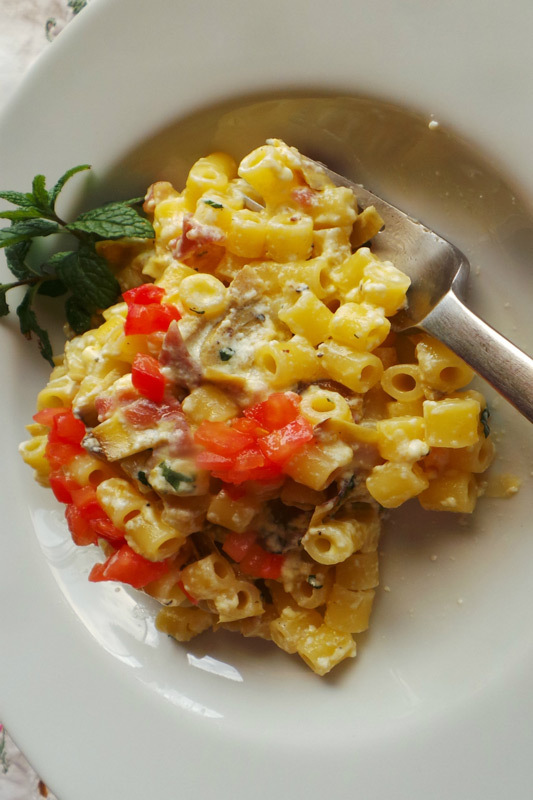 Transfer the pasta to the bowl and toss with the cheese and artichoke mixture. Sprinkle the tomato on top and serve.